What a wonderful card drive, Yvonne. Thanks for letting us know about it! Great idea! I will take a look. This is a wonderful idea. I cannot even fathom the magnitude of the destruction all of the flooding caused. My heart goes out to everyone involved. I have been reading about this...and how sad for these families to lose everything in such a horrific manner. Thanks for posting! thanks so much for sharing, may God richly bless all who are touched by this. My goodness...I wasn't aware of the tragedy in Australia! What a nice site to share. 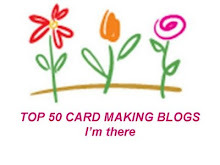 Wanted to thank you for visiting my blog. Glad you liked the pin cushions!! You have some lovely creations yourself! I think my favorite was the bag/notecard set...beautiful!! I have not seen that bag idea before--love it! Also noticed your question about the light box, but didn't read responses. It is something I struggle with also. If it is something you are still interested in, I know a fellow blogger who made her own and posted on it. I would be glad to share with you, if you're still interested. Let me know. Thanks again for your sweet comments! Thanks for commenting on my blog. I have been to Australia twice and enjoyed it fully! The Aussies are great people. Would love to return some day. Was sorry to see and hear about all the flooding. What a great idea.